Why are we still continuing with a "viceregal" political system? Writing in the 1950s, Khalid Bin Sayeed termed Pakistan's political system as "viceregal". He argued that after partition and independence in 1947, the ruling elites of the two successor states adopted two different political models. India chose the British style of parliamentary democracy and Pakistan continued with the British colonial model of a 'viceregal" system, where power was centralized in the hands of the chief executive - the Governor General - who tended to behave more like a Viceroy not accountable to a cabinet or a parliament. Our political leaders rejected this "viceregal" model during the nationalist movement of the 1950s and 1960s, and again during the democracy movement of the 1980s.Yet when they assume state power, our leaders seem to fall back on the same "viceregal" model. Since 1991, we are a parliamentary democracy in name only, as our parliaments hardly function - opposition being mostly absent from the parliamentary sessionsand our prime ministers are certainly not "first among equals" as is supposed to be in a parliamentary democracy. 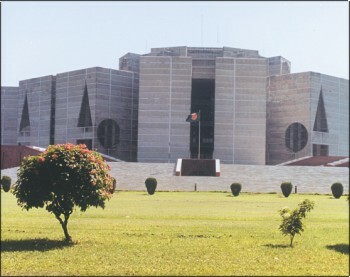 The Public Expenditure Review Commission (PERC) in its recent report (The Daily Star, January 19 and 20, 2004) questioned the utility of maintaining the Prime Minister's Office (PMO) on the ground that such a separate office is justified only in a presidential form of government and not in a parliamentary system and recommended closing down of the PMO. The report also notes proliferation of ministries since independence from 21 to 38. However, the increase in the number of ministries do not appear to have made any impact on deconcentrating decision making from the prime minister to other ministers. The "viceregal" system is not the hall mark of our system of government alone. Our political parties are also run in this fashion and civil society organizations are not immune to this style of governance. The concept of a leader being "first among equals" seems very difficult to establish in institutional contexts in our country. Institutions are beset with factions and groups who are held together not so much by institutional rules and accountability measures, but by leaders who are perceived to be more than equals by the factional/group leaders. Indeed, a group of equals do not seem to have a chance to exert leadership and govern an institution. It appears the claim to leadership is easier to establish when the leader possesses some unique attributes which others within the institution cannot attain by simply serving the institution. If the latter criterion is used, then there could be several claimants to leadership but none may be acceptable to the contestants. When a peer group is unable to accept one amongst them as the "first among equals", the search is on for a leader who has some special qualities that makes her/him more than an equal. For example, many will argue that our two main political parties will break up in factions unless they are led by the two incumbent leaders who possess such special qualifications. They are the dynastic inheritors of the political mantles of two slain leaders whose memories are still being used by their respective parties as major political capitals (Of course, the dynastic pattern of leadership is noticeable in all South Asian countries, and for that matter in other parts of the world). Leadership pattern of non-political institutions is not much different. Civil society organizations are often led for decades by the founders who are again not held accountable to a group of their peers within the organizations. Indeed few institutional leaders make deliberate plans to promote a cadre of leaders capable of succeeding them. A frequently used indicator to assess the degree of institutionalization of an organization is its capacity to manage its leadership succession in a peaceful and routine manner. I wonder how many organizations in our country will pass that test! Leaders are no doubt important for guiding institutions, but laws, procedures and accountability mechanisms are even more important for sustaining democratic institutions. Our scant attention to rule of law and continued dependence on leaders is perpetuating the "viceregal" system, which is breeding sycophancy. Yet if we look at our past history, we find periods when our political parties and political movements were led not by a single supreme leader but by a leader who was recognized as a "first among equals". The party and the movement did not suffer by that style of leadership when the leader consulted his peers and was accountable to them. Indeed, parties and movements gained strength in the 1950s and 1960s when there were multiple mid and high ranking leaders who were capable of succeeding top leadership when they were imprisoned. How can we get out of this "viceregal" system? There is no easy answer. When a system persists for a long time as this "viceregal" system has, we have to realize that there are enough powerful interest groups inside and outside the country (in a donor dependent country, one has to take into account external actors), who are benefiting from the system and sustaining it. The majority of our citizens may not be benefiting indeed they are suffering but they can do very little to change the system except to throw the incumbents out through the exercise of their votes. But after three such consecutive elections, the citizens are well aware of the limitations of elections to bring about real systemic changes. We need to think more creatively about other ways to hold our leaders accountable. Our newspaper have been playing a very positive role in flagging the various maladies plaguing the country. Almost every day we read reports about corruptions, human rights violations and breakdown of law and order. In similar vein, we need to raise public awareness about leadership, that leadership is often created by particular situations, and even ordinary people can provide great leadership when they are given opportunities or when they or their communities are challenged. Our own history is full of many such shining examples. We need to recognize them. Of course, the vision and judgment of a supreme leader can make a major difference. Nelson Mandela is a case in point. South Africa's politics would have taken a very different turn had Mandela not renounced the politics of revenge and adopted the path of reconciliation instead. He voluntarily stepped down to make way for a younger leader. If our young politicians are genuinely interested in becoming good leaders, they need to take lessons from the lives of leaders like Mandela. Slogans and wall writings are two of our favourite ways of mobilising young people into politics. These slogans and wall writings mostly revolve around individual leaders. I wish our political parties would use the two basic principles of parliamentary democracy, which many of us memorized in our civics classes, as materials for their slogans and wall writings. The two principles are: first, in a parliamentary democracy, the majority rules with the consent of the minority, and second, a Prime Minister is only "first among equals". The author is Senior Research Scholar and Adjunct Professor, International Affairs, Columbia University.